You simply add seo [ʃɔ], sin [ʃin], and ud [əd] to whichever noun you wish. They can't appear on their own, so linguists call them enclitics because they must latch on to a host noun. Note that the distinction between precise and fuzzy locations, (cf. an-sin vs. thall) largely does not enter this arena. The idea of fuzzy locations includes both far off and near by locations so thall is a "fuzzy location distant from the speaker" and a-bhos is a "fuzzy location near the speaker". However, the one thing you can do is to add thall to ud to give the meaning of "that thing over there", for example, a' phoit ud thall. You can not do that with sin, neither can you add a-bhos to seo. So, you might ask, where does siud come into it? Good question. It comes into play when you build sentences which are seemingly missing a verb, such as seo mo mhàthair which gets translated into English as 'this is my mother'. As you all know, in Gaelic, that's the easiest way of building a declarative sentence about existence, without getting into hot water about choice of verbs etc. I suspect that the s- in siud [ʃid] is simply an analogy to seo and sin to try and make ud fit in with seo and sin. However, it might just be the verb, is, itself. I'll try to find out, so watch this space. 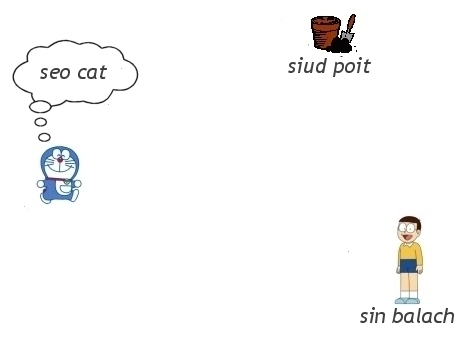 At any rate, that's how you use siud in a declarative sentence about existence: 'that's a pot', 'this is a cat', 'this is a boy' etc. Incidentally, this also works with definite nouns, for example, seo an cat 'this is the cat'. Just in case you were wondering. Air a tharraing à "http://akerbeltz.org/index.php?title=Demonstratives_or_An_cat_ud_thall&oldid=2156"
Chaidh an duilleag seo a dheasachadh 18 dhen t-Sultain 2013 aig 04:51 turas mu dheireadh.